'Travel west young man' was an adage used in the past to entice folks into the outback - a world full of adventure and mystery. Today, travel west and your journey will still be filled with adventure but luckily, you don't have to take the rutted bush tracks of the past. Mostly sealed bitumen roads lead to you to new and exciting places, where the people are friendly and appreciative you've made the journey into their part of Australia, and the views different each step of the way. The Warrego Way starts at the Sunshine State's capital, Brisbane, and finishes in the iconic and remote Birdsville. Along the way, you can see ancient trees from the dinosaur age, endangered mammals, unwind in the soothing waters from the sub artesian basin, delight in yarns told over country bars, or just relax and enjoy the brilliant sunsets and starry nights. Watch the city skyline of Brisbane disappear behind you as you enter the city that almost stole Brisbane's capital status - Ipswich. Historic Ipswich, Queensland's oldest provincial city, oozes with charm in its sprawling gardens and magnificent private and public buildings. Ipswich was once a thriving river port and the wealth generated by its pioneers is clearly reflected in the grand early nineteenth century architecture. One such stately building is the restored Old Town Hall, now home to the Ipswich Art Gallery, an interactive art gallery and social history museum worthy of a visit. There are many heritage buildings to enjoy on the leisurely self-guided walk and there's a brochure available from the visitor information centre. For history and rail enthusiasts, the Workshops Rail Museum in the former north Ipswich rail yards will find you amongst living rail history. The next stop on your journey along the Warrego sits right on top of the Great Dividing Range; Toowoomba. After leaving Ipswich, it's not long before you're passing through the Lockyer Valley. Your travels will take you close to or through the friendly villages of Rosewood, Marburg, Laidley, Forest Hill, Gatton, Grantham, and Helidon. Follow the highway as it winds steeply up the eastern side of the Great Dividing Range. The road is two lanes through to Toowoomba, which makes for an easier journey. You'll be sharing with slow travelling trucks on the steep grade so be prepared to travel slowly up the range; they'll appreciate your courtesy too. Once at the top, you're in Toowoomba, Queensland's Garden City. The distinctive seasons and fertile soils have given rise to a city filled with over 150 wonderful gardens and parks. Many follow themes such as the Scented Garden and Japanese Garden. Toowoomba puts on a sensational show of colour in springtime. The city is blanketed in a kaleidoscope of blooms, with many private gardens open for viewing during the Carnival of Flowers Festival in September. Toowoomba offers the visitor everything - a wide range of accommodation for all budgets and many fine eateries, restaurants and shops. Time to continue along the Warrego: next stop Dalby. Once out of Toowoomba the paddocks open up and you are now well and truly in the Darling Downs. Close to the highway is the Jondaryan Woolshed, built in 1859 and recently restored. The centre pays homage to the rich wool and pastoral history that founded the area and it's not hard to spend a day walking around there. Then on to Dalby, the hub of Australia's richest grain and cotton growing area. The Thomas Jack Park should be your first point of call. In the gardens is the Visitor Information Centre where they will be only too happy to fill you with activity suggestions for your visit, no matter how long it is for. Highlights of a visit to Dalby can include Jimbour House, Lake Broadwater Conservation Park and visiting a cotton gin in full production during the picking season from around April to June. From Dalby it's a drive of 83 kilometres to Chinchilla. The hamlet of Warra may not look much at first, but turn down the street and visit the Warra Hotel; a fantastic, rambling old timber pub. Nearby to Warra visit a coloured cotton farm and insectary where predatory and beneficial insects are bred for use in agriculture. Back on the Warrego and you pass the little towns of Brigalow and Boonarga before entering Chinchilla. Chinchilla, now well known for it's biannual Melon Festival, is also a favourite destination for petrified wood fossickers. Lapidary enthusiasts just love the specimens from this district, called 'Chinchilla Red', due to their unique beauty and intricate patterns. Licenses are required to fossick but they're relatively cheap and readily available at the Information Centre, where you can also get a map to show you the best places for a day's exploring and fossicking. Visit the Chinchilla White Gums, a beautifully tall and straight eucalypt native to this area. The next stop, Miles, is only 45 kilometres further. Think of Miles and think of wildflowers. When the season is favourable, the Murilla shire bursts into bloom. A must for visitors to Miles is the Miles Historical Village where more than 20 buildings are open to the public. Carefully restored and refurbished, each building captures the essence of its original use early last century. But wait, there's more! Here at the village you can see some interesting displays like the amazing shell collection, considered the largest privately owned collection in Australia, the world-class lapidary display, along with an extensive collection of war uniforms and memorabilia. Further down the main street is the Dogwood Crossing centre, which was the original name given to Miles. Here you can watch and listen to stories told by the locals of droughts and floods in the wonderful water wall, marvel at the seven-metre-high steel bottle trees, which look magnificent at night, or wander the art gallery. After a full day or two in Miles it's time to head due west to Roma, 140 kilometres further along the Warrego. Leaving pretty Miles you pass through the townships of Drillham and Dulacca, both established with the coming of the railway into the west. Dulacca rose to notoriety as the first site for the extensive push to eradicate the prickly pear. You'll then pass through Jackson, Yuleba and Wallumbilla where a stop at the Calico Cottage is a must. You won't miss it as it's under the huge shed. Delectable home baked goodies line the shelves just waiting to tempt you and your taste buds will be eternally grateful so give in to this temptation. Then, welcome to Roma, the capital of the Western Downs, the home of the 'Big Rig' and the gateway to cattle country. Every Tuesday and Thursday you can join in the excitement at the Roma Saleyards, which is the biggest cattle selling facility in the southern hemisphere. With special catwalks for visitors to see all the action, there's arguably nowhere else you can have such an experience. Visit the Romavilla Winery, which is the oldest winery in Queensland, head to the Mount Abundance Homestead for a history lesson and do the Hospital Hill Walk. Then, it's on to Mitchell, which is an easy 89 kilometres west. Into bushranger territory, the Warrego now takes you on your journey to Mitchell through the villages of Muckadilla and Amby. At the turn of the century the Kenniff brothers ruled the ranges around here. That was until they made history as the last Australian bushrangers trialled for murder right here by the side of the Warrego in the Mitchell courthouse. Seven kilometres south of Mitchell, a steel monument marks the site of their last bold but futile stand. Mitchell is where many say the outback begins. One of the most worthwhile attractions in Mitchell is the Great Artesian Spa, the largest open-air spa in Australia. Let the high mineral content of the water from the Great Artesian Basin relax and revitalise you. Many travel here for its therapeutic benefits. Mungallala is the only town you pass through on your trip west from Mitchell to Morven. Just before Mungallala is a protected area where you can walk amongst the rare Ooline (Cadelia Pentastylis), a remnant pocket of rain forest trees dating back 1.6 million years. There's a picnic table and toilet available for your morning cuppa. Mungallala, population around 130, originated as a railway town. Stop at the pub by the side of the road and you're likely to meet a local for a yarn. Fuel, food, and accommodation are available at Mungallala. Morven, which the locals say is small in size but big in character, is an easy 44 kilometres from Mungallala. Established as a camping site for bullock teams and originally called Sadlier's Waterhole, the collection of immaculate miniature buildings creatively whittled by the late Bob Johnson representing early Morven and district is most worthy of inspection at the Morven Historical Museum. If time permits, visit Tregole National Park, 10 kilometres south of Morven, which is a 7500 hectare park where the brigalow meets the mulga. Once you say goodbye to Morven, it's the last leg on the mighty Warrego Highway and only another 89 kilometres to Charleville. Roll on to Charleville, immortalised in Slim Dusty's song by the same name. You'll notice that the rolling grazing country becomes wild mulga scrub edging the road as you drive further west to Charleville. Tinted orange from the red dust, it forms a valuable food source for stock in times of drought and provides a perfect refuge for the native birds and animals of the western plains. Schedule a couple of days in Charleville and enjoy the diverse attractions. For an appreciation of life in the outback, visit the Charleville School of Distance Education and the visitor centre of the Royal Flying Doctor Service. Hear the sound of the didgeridoo and watch Aboriginal artists at work at the C.D.E.P. (Commonwealth Development Employment Project) centre; visit the grand old Hotel Corones, the biggest outback pub in Australia, with its resident ghost; and at night take in the star studded outback night sky at the Cosmos Centre. There are plenty of accommodation choices and fabulous bakeries and butchers in Charleville. Alternatively, catch your own feed of fish. Fishing the Ward River is popular in Charleville and with the local fishing club restocking the waters you can almost be assured of a catch. Quilpie is a 210 kilometre drive from Charleville along the sealed Diamantina Development Road. A stay in Quilpie can be as busy or as relaxing as you choose. Picnic at beautiful Lake Houdraman, catch a yellow belly or some yabbies in the river or swim a few lazy laps of the newly renovated Aquatic Centre. Sit back and enjoy the unique flora and fauna throughout the surrounding countryside. Those ready for action can spend the day fossicking for opals, climb and explore Baldy Top and Table Top Lookouts or go four-wheel-driving through the endless landscape that is Australia's outback. While exploring, listen for famous names such as Tully, Durack and Costello, who were among the region's first settlers. On the interactive compact disc at the Quilpie Museum and Visitor Centre, hear from the horse's mouth about the struggles of droughts, floods and isolation of outback life, particularly during the days of early settlers. From Quilpie you have the option of taking a short 106-kilometre detour along the Cooper Developmental road to Eromanga. Eromanga is home to the internationally recognised Eromanga Natural History Museum where you can meet Australia's largest dinosaurs including 'Cooper' and 'George', who are in the top 10 largest dinosaurs in the world. The museum is three kilometres outside of Eromanga off the Mt. Margaret Road (all sealed roads!). The partly sealed Kyabra Road will connect you back onto the Warrego Way. Windorah is smack bang in the middle of the channel country, a fertile area of grazing land that produces some of the world's best beef cattle. The term channel country refers to the intricate network of braided channels. Most of the time the water is confined to deep, permanent waterholes that are perfect spots for camping and fishing. Points of interest include the mirrored solar panels reflecting vibrant outback colours and the red sand hills, where you can watch the sun set from the crest of a magnificent red sand dune while sipping a glass of your favourite wine. Hit the gravel roads (not recommended in wet weather) to Birdsville, Australia's iconic 'must visit' town. The town is a hub for intrepid travellers heading across the Simpson Desert, the largest area of parallel sand dunes in the world. Sit atop the 40 metre high 'Big Red', the biggest sand dune on the eastern edge of the desert, and watch four-wheel-drivers take on the challenge of the steep and sandy tracks. Sit beneath a roof covered in the weathered Akubras of people who have done the 'hard yards' in Birdsville for at least one year at the Birdsville Hotel after scoffing a unique 'curried camel' or 'kangaroo claret' pie at the Birdsville Bakery. 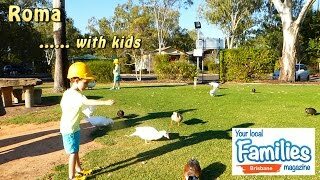 The Wirrarri Visitor Information Centre offers an historical display and the bank of the Diamantina River is a fantastic spot for fishing or enjoying a picnic. Visit the extremely rare Waddi trees, which only grow in three places in the world. The famous Birdsville Races attracts over 8,000 people to the town on the first weekend of September each year.